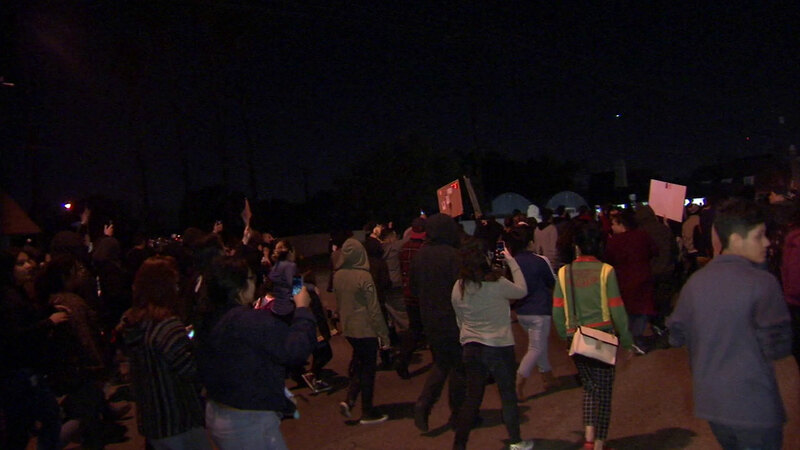 ANAHEIM, Calif. -- Authorities arrested 24 people after hundreds took to the streets of Anaheim to protest an off-duty officer's confrontation with a teen that was captured on video the day before. The confrontation between an off-duty Los Angeles officer and a 13-year-old boy took place Tuesday. In a few videos captured at the scene, it shows the officer fire his weapon outside of his home as he tried to detain the teen. No one was injured. Protesters took to the area of Euclid Street and Palais Road, where the incident took place, and clogged intersections Wednesday night. At some point, a home was spray painted with anti-police graffiti, but it was unclear if that was the officer's home or just a random residence. Cars were also vandalized and windows to another home were broken. Police later declared a tactical alert for the area. Authorities said 10 men, 8 women, three male and three female juveniles were all arrested and face misdemeanor charges ranging from failing to disperse, resisting arrest and battery on a peace officer. According to Anaheim police, Tuesday's confrontation stemmed from ongoing issues with juveniles walking across the officer's property. The officer had said the confrontation escalated because the teen threatened to shoot him, but the young man's mother said he was threatening to "sue" for how he was being treated. Videos also show the off-duty officer holding onto the teen while several other young boys try to stop him. The 13-year-old boy was arrested and booked at Orange County Juvenile Hall for criminal threats and battery. A 15-year-old boy was also arrested for assault and battery and was released to his parents. The circumstances surrounding the firing of the weapon were being investigated by the Anaheim Police Department's Homicide Detail. As part of routine procedures, the officer was placed on paid administrative leave while the incident is investigated. The LAPD is conducting its own internal investigation into the officer's actions. Anaheim Mayor Tom Tait said the city is committed to a "thorough, impartial investigation" of the confrontation. The case is set to be presented to the Orange County District Attorney's Office when it is completed. The names of those involved in the incident were not released. The ACLU was among those expressing criticism of the officer's behavior in the incident. "An officer, even off duty, has an obligation to follow the law and protect public safety, rather than threaten it," said Jennifer Rojas, an official with the ACLU of Southern California. "The LAPD officer's actions on the video are grossly irresponsible." Tait and Anaheim Police Chief Raul Quezada are expected to speak about the investigation during a press conference Thursday.